Story-driven RPG follows two characters with opposite personalities. Falcom has officially announced The Legend of Heroes: Akatsuki no Kiseki, a new online story-driven RPG celebrating the Kiseki series’ 10th anniversary. The game, which we discussed briefly earlier this week, is in joint development with the Taiwan-based UserJoy Technology. Its platform is unannounced. As novice Bracers Nacht Weiss and Chloe Barnett, players will resolve a variety of incidents in various locations throughout the Zemuria continent, including the Crossbell State, Liberl Kingdom, and the Principality of Remiferia. That said, there will be both new and returning characters in the game, with the new characters being designed by The Legend of Heroes: Trails in the Sky series main illustrator Haccan. Find our first details on the game’s story and its two protagonists below. Western Zemuria, Crossbell State. Nacht Weiss, a boy who’s longed to become a Bracer for much of his life, encounters on the day of his certification exam Chloe Barnett, a girl sporting black hair, a rare sight in those parts. Much like Nacht, Chloe has also come to take the same exam as well, albeit from the Liberl Kingdom. As they both descend underneath Crossbell City together to the Geofront to take their examination, they catch word of a “Special Support Division” from Michelle, a secretary working as part of a Bracer outpost. And thus begins the grand adventures of the unwieldy pair of Nacht and Chloe. Nacht is a boy whose nationality is unknown and strives to blend in as much as possible as to lead a normal life. Having originally intended to just take up a steady stream of small jobs upon becoming a Bracer, those plans get thrown out the window once he’s paired up with Chloe for his partner, whose personality happens to be diametrically opposed to his. Highly proficient in combat techniques, in addition to knowing his way around fighting with a halberd that comes equipped with an Orbal gun, he can also set Orbal land mines. Chloe comes from the Ruan region of the Liberl Kingdom. Taking cues from tales of chivalrous knights she heard while growing up, she has a strong sense of justice and conducts herself in ways that would have been deemed more conventional in ages past. Obsessed with the heroic Bracers who helped resolve the Calamity of Liberl, she drops out of Jenis Royal Academy to become a Bracer herself in spite of much consternation on the part of her parents in doing so. 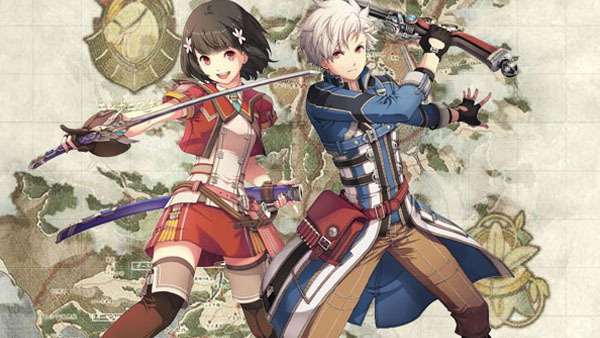 The Legend of Heroes: Akatsuki no Kiseki will launch in 2015. View high-res artworks of the new characters at the gallery.